So after 20 years of having ‘ski holiday’ on our bucket list and having got no closer to anything more winter sporty than snow angels, we are finally here. 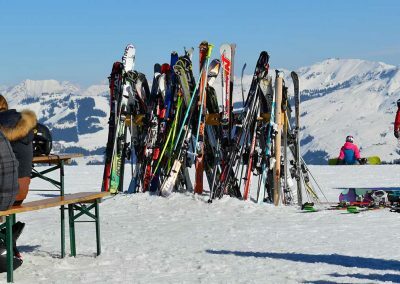 The other half and I stand there like two scared kids on the nursery slopes of Westendorf in Austria with huge plank things strapped to our feet. We are trying to listen and watch what our instructor is trying to teach us when, suddenly our youngest son comes zooming past like a pro, backwards. How can this be? He has only been learning an hour! I can see from my wife’s face that she’s thinking the same thing as me – OMG, what have we done? Maybe it would have been safer just to spectate from the bar. 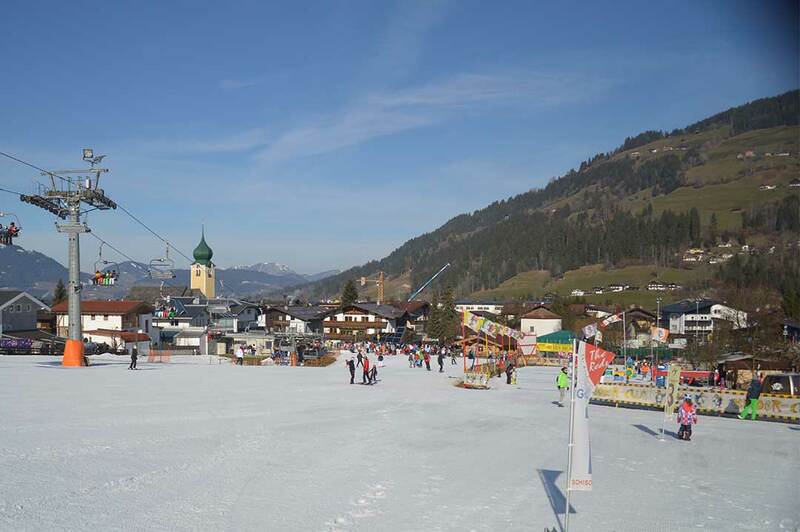 Westendorf is located in the Tirol area, which used to be a place where people only passed through: merchants travelling from Holland and Germany to Italy and tourists on their way to the Italian or French Riviera. But times have changed and the Tirol is now a destination in its own right as a Mecca for winter sports enthusiasts, of all abilities, who want to enjoy more than 350 kilometres of ski runs in the Ski-Welt area. 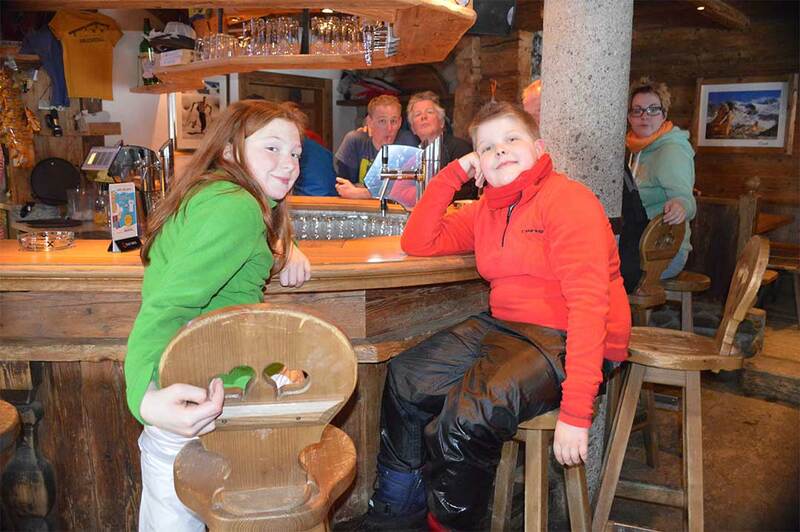 Our home for the week was The Alpenhof, a chalet-style hotel just a few meters from the town centre. The owners, Ingrid and Walter, gave us a warm welcome and showed us to our rooms. Pine panelled with balconies looking across the valley, they were warm and cosy just like you would imagine in the mountains. 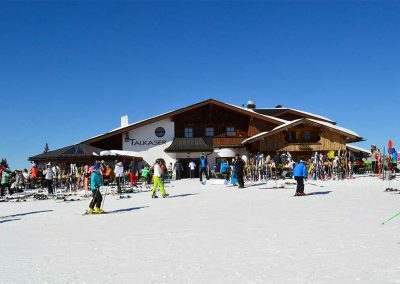 The hotel is privately owned and family run and was originally built by Ingrid’s parents back in 1960 in the traditional Austrian style. Over the years the family have worked hard to expand the hotel, adding more rooms and modernising. 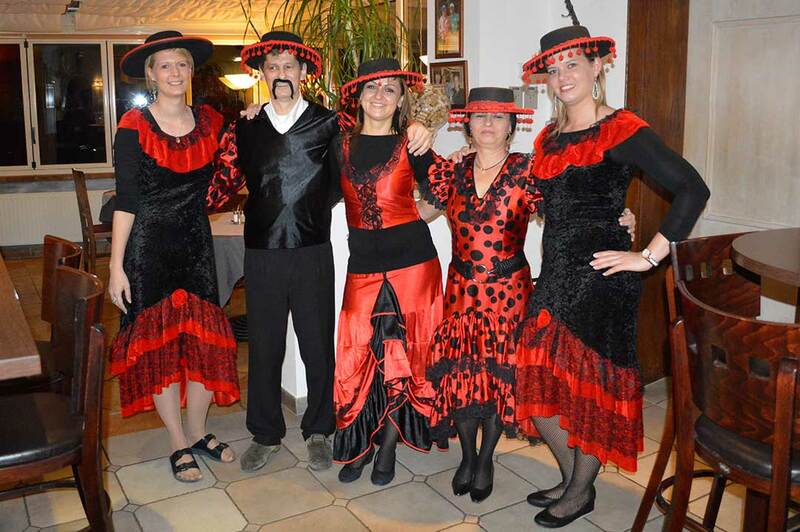 The family and staff pride themselves on extending a warm Austrian welcome to all their guests who were a good mix of British, German, Dutch, Belgian, and of course Austrian. 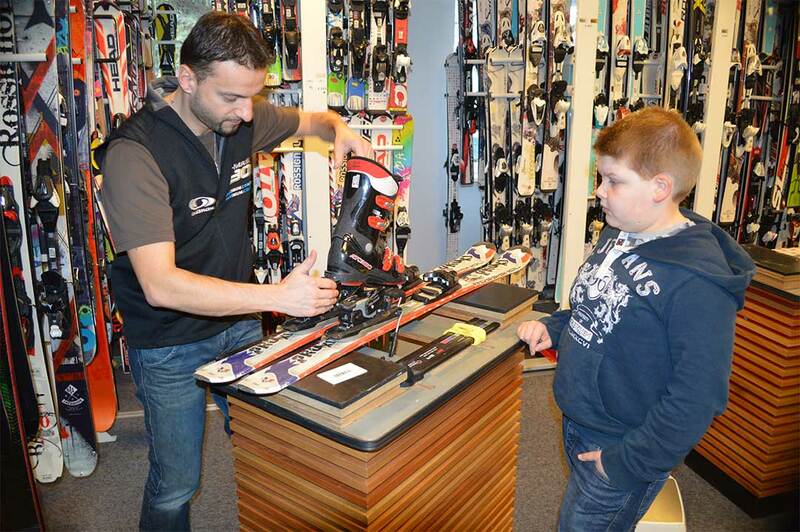 All of the staff was very friendly and helpful and spoke very good English. 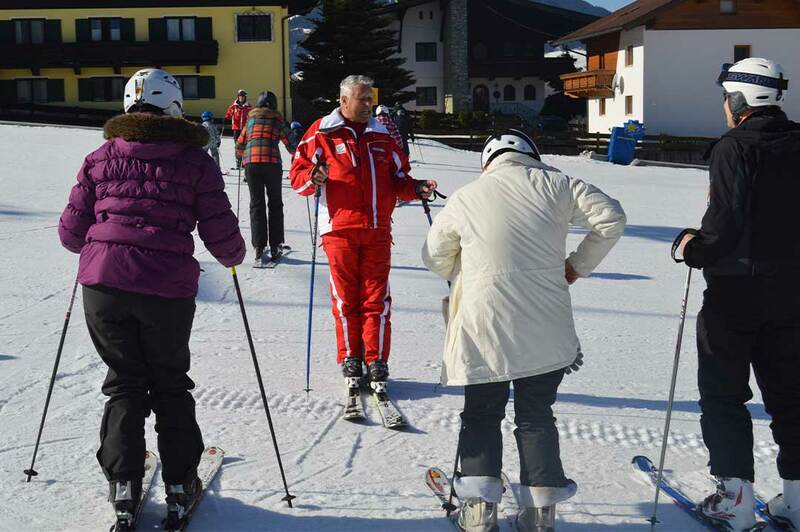 Next stop was The Red Ski School where we were greeted by Hans Fuchs, a true professional who guided us through the process of choosing our courses. 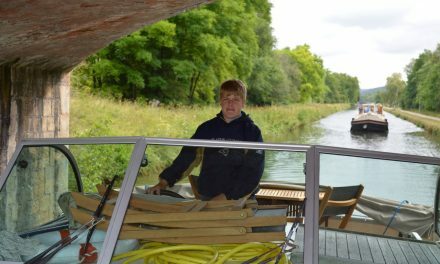 As complete novices, we took Han’s advice and plumped for five days of lessons, two hours in the morning and two in the afternoon, starting at 10 o’clock the following morning. 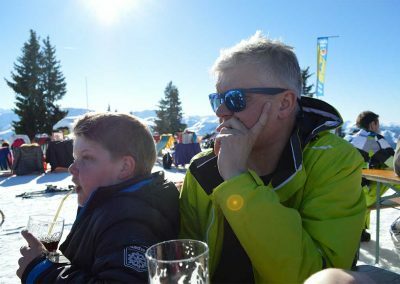 By now, there was not much time left to get out on the slopes so we had no choice but to begin sampling Westendorf’s après ski scene. 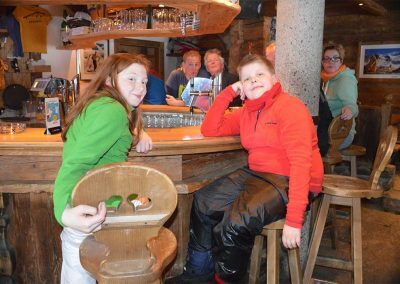 The resort has a great selection of bars, ranging from lively all-singing-all-dancing venues to smaller, quieter ones for those who prefer to sit and relax after a day of activity. Skiers and snowboarders start to come down from the slopes and mountains around 4 o’clock and the après ski bars come alive with everyone still in all their ski gear. The atmosphere in the town is brilliant. 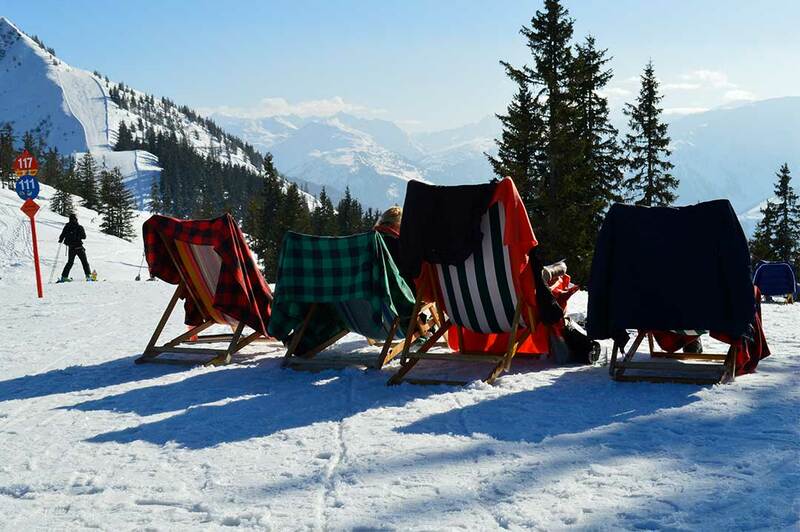 One of the more popular après ski drinks is Gluehwein (a mulled wine), which is reputed to make you glow with warmth again after you come in out of the snow. Schnapps is another favourite and, of course, the famous German beers, which usually come served in half a litre or litre glasses. 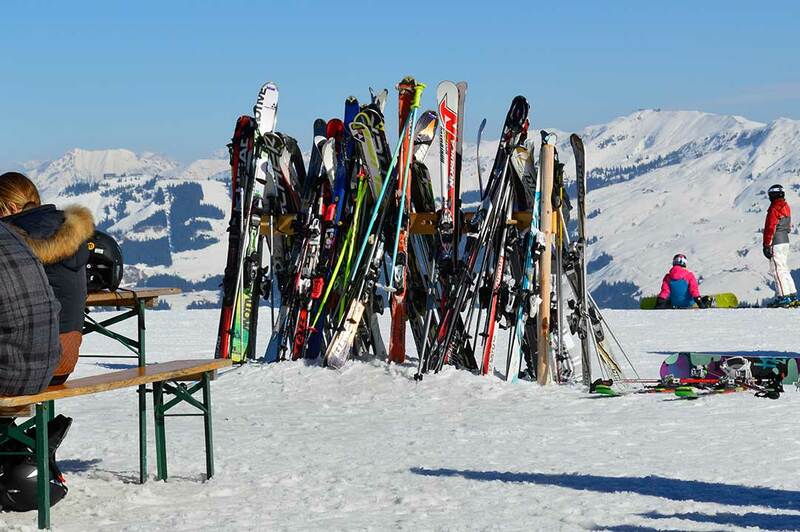 Word of advice though, make sure that your skis are well and truly off for the day before you drink any alcohol. 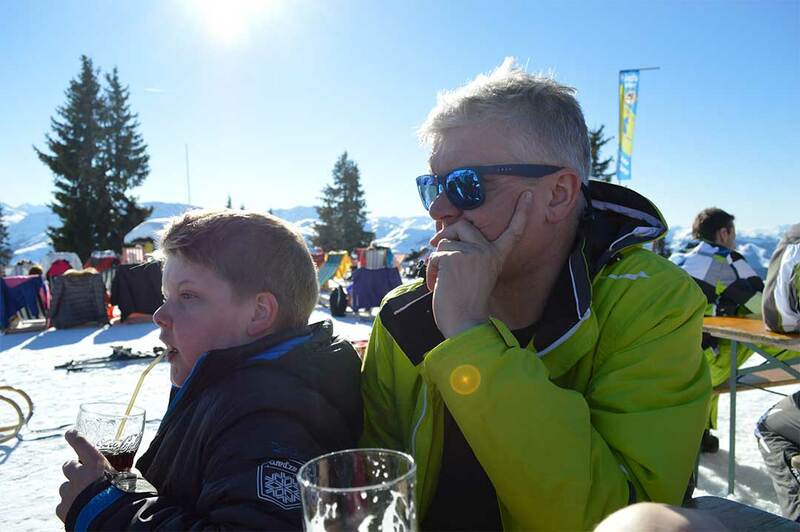 It may make you feel that you can downhill like Sofia Goggia or Aksel Lund Svindal but too much Dutch courage could really ruin your holiday. I don’t want to be the fun police but be careful. Whilst soaking up the warm and welcoming ambience of the hostelries be sure to have a go at the ‘nail game’ which you will see being played in most bars. 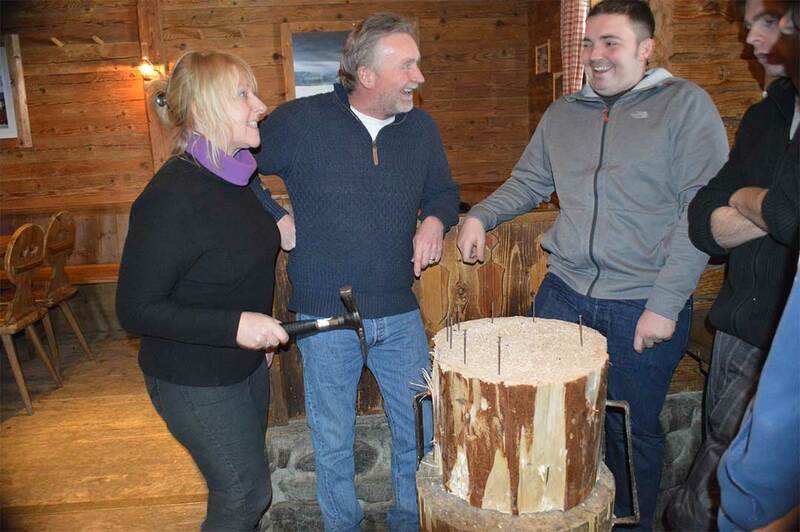 The aim of the game is to knock a nail into a tree stump with the sharp/narrow end of a hammer. Each player takes it in turns and the last one to drive the nail flush with the stump loses and must do some kind of forfeit, usually involving some kind of alcoholic beverage. 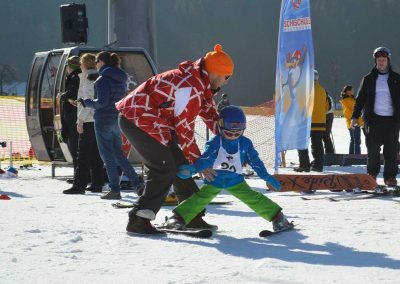 Be suspicious if you are challenged to a game by a ski instructor though, they are well practised and very good. There is an abundance of restaurants, too, many of them within the hotels. 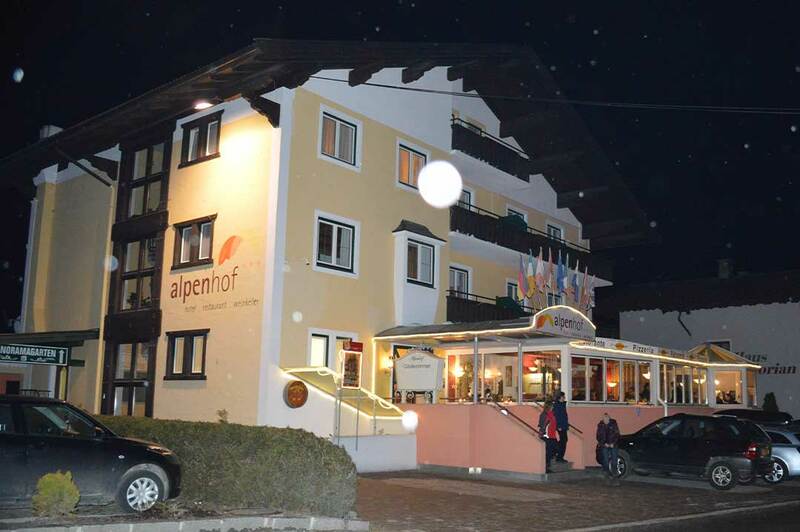 The Alpenhof Hotel, for example, has a pizzeria and a beer Keller with live music in the basement. The overall quality of the food was excellent and we always left feeling that we had received good value for money. 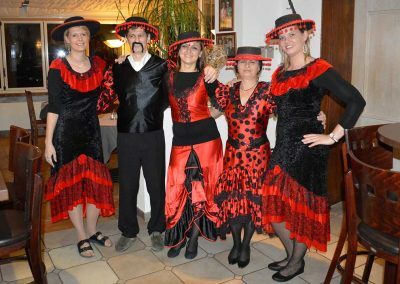 The variety was very good too, with traditional Austrian food such as Wiener Schnitzel (a breaded and fried veal escalope), Knödel (a sweet chocolate-filled dumpling served with custard) or more familiar dishes if you’re not feeling too adventurous. 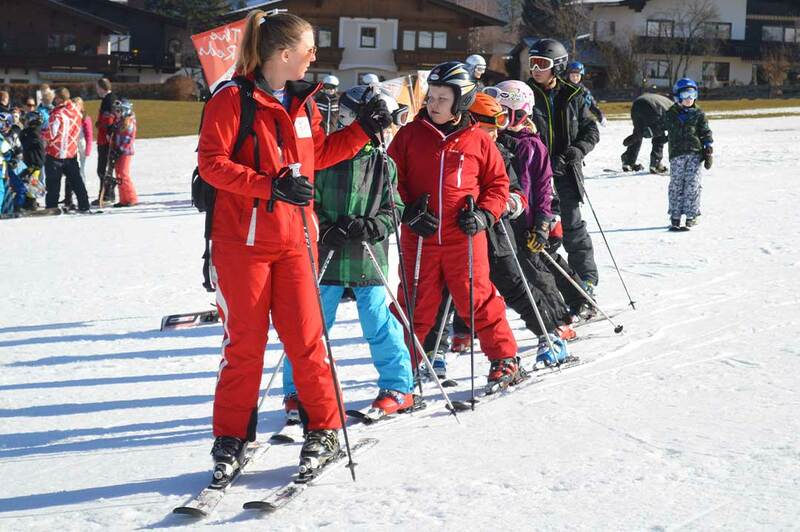 Sunday morning we were all chomping at the bit to get started on the snow so we plodded off to the Red Ski School. My wife, Corinne, and I were put in the ‘oldies’ English speaking group with another five beginners and introduced to our instructor. 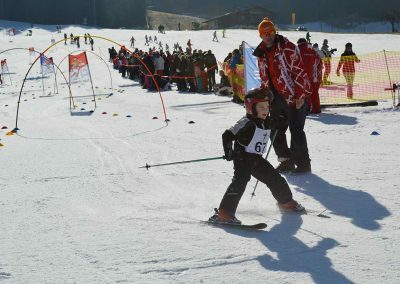 Howsie was actually 78 years old (much to my wife’s disappointment) and had been a ski instructor in the area for over 50 years. We were in good safe hands. 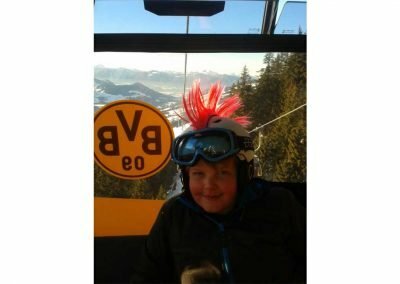 My sons, aged 16 and 11, were put in beginner groups relative to their ages. Before the trip, Corinne had been a little bit worried about being separated from the boys during lesson time, particularly the youngest, Jimmy. 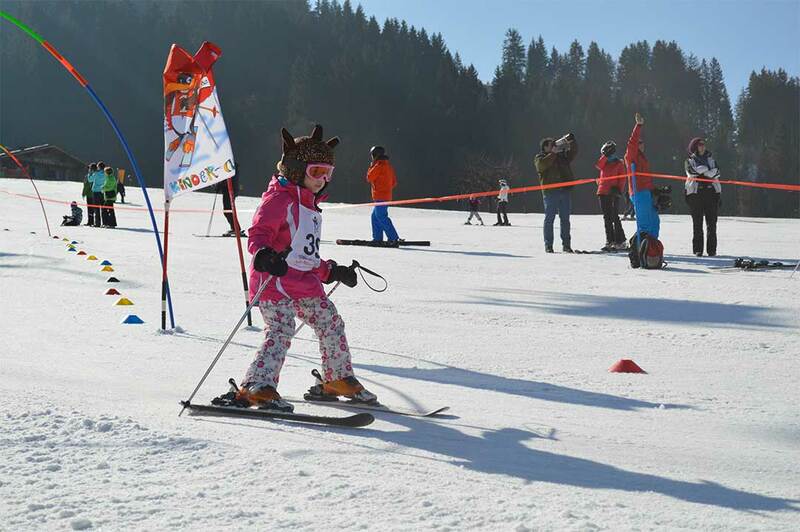 But any concerns soon dissipated once we saw how well they were handled by the ski instructors. The kids were clearly having fun, singing and laughing, but with just enough discipline to keep them all in order. 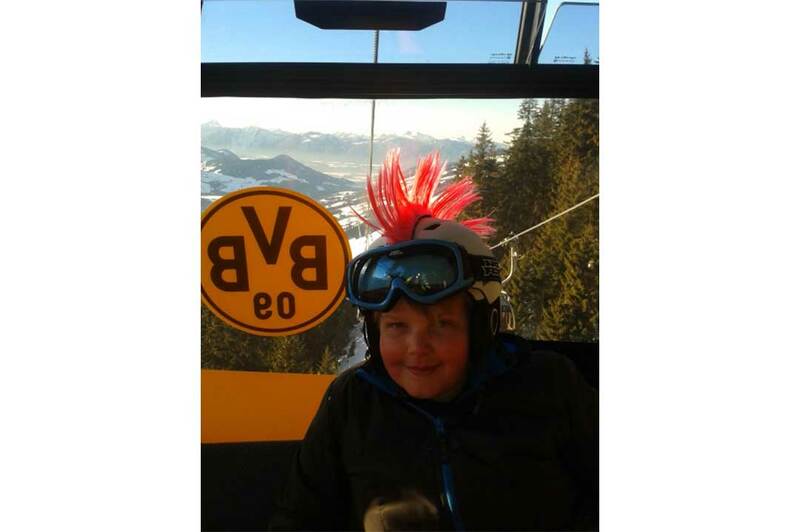 In Westendorf, there is a great system on the ski lifts where all the smaller children wear a Gillet with a metal plate in the back. When they are helped onto the chairlift there are magnets in the back of the chair that automatically activate as the chair leaves the lift station. This then attracts the metal plate thus ‘sticking’ the child to the seat, making it impossible for them to slide out from under the bar. The speed of the progress that the youngsters make is phenomenal. 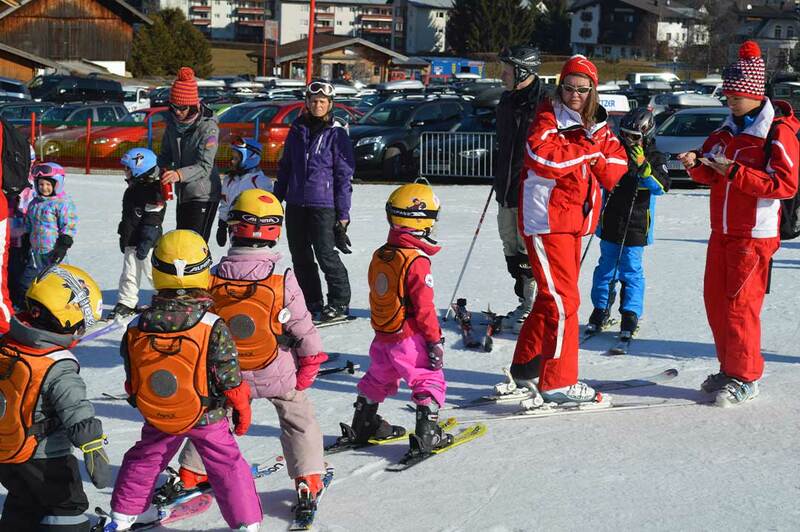 I was fascinated all week by the tiny toddlers buzzing round like little bees completely natural and at ease with their tiny skis. 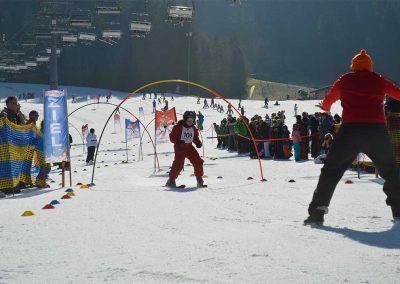 You could see them zig-zagging down the slopes in serpent-like lines with one instructor in front and another behind picking up any stragglers, all sporting their hi-vis tops and lift magnets. As for us adults, progress was not quite so rapid. 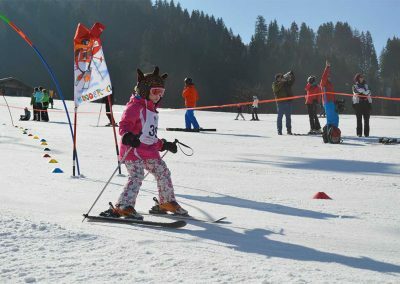 As the week went on, the nursery slopes became quieter as the younger groups were ‘promoted’ to the top of the mountain where the lessons continued but in better conditions. 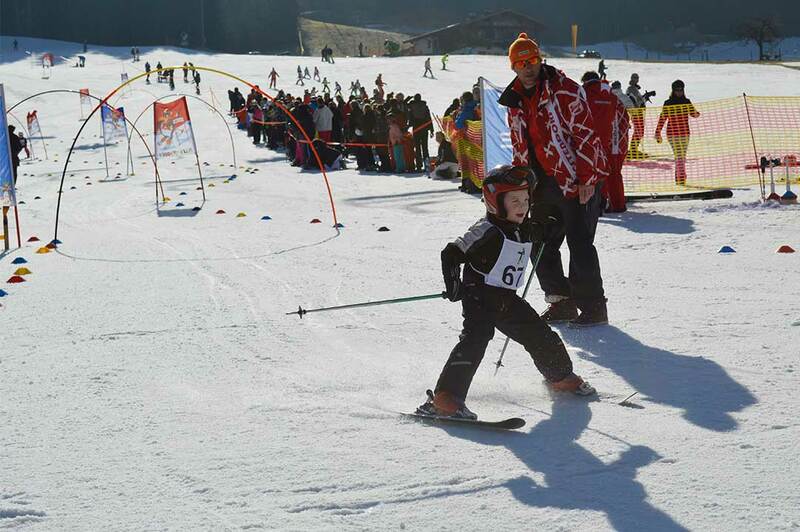 Our sons only had one day on the nursery slopes and they were off. For us, it took a few days longer. We did get up there, eventually, and it was well worth it as the conditions and the views were spectacular. 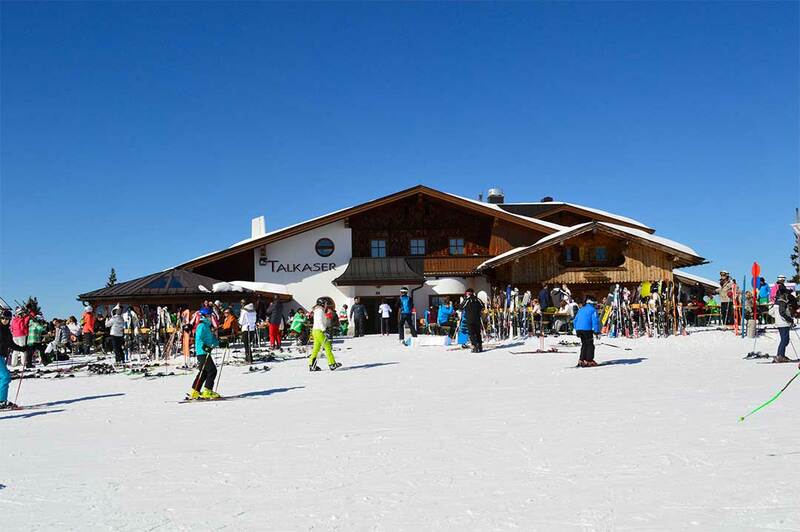 A restaurant at the top serves lunches and drinks all day and many skiers were sunbathing on deck chairs outside with beautiful crisp snow all around them. I sat for a long time just taking it all in, breathtaking. 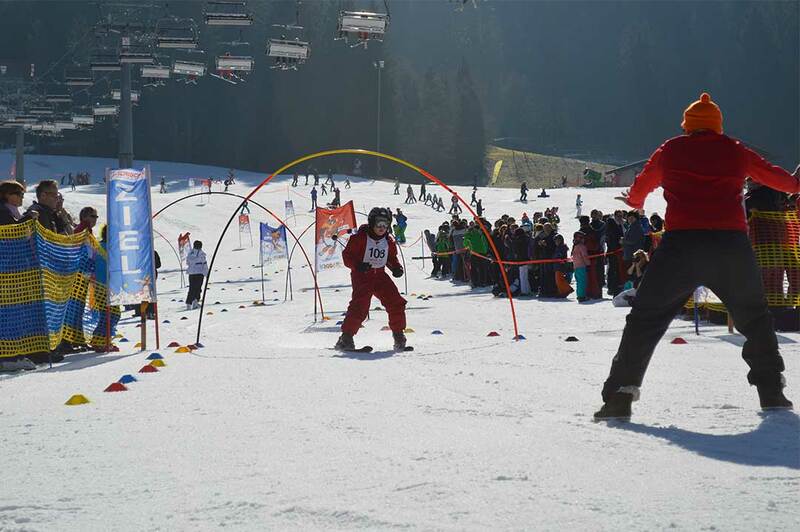 At the end of the week, the ski school organised an event which included slalom races and a chance for all the youngsters to show off their newly learned skills. 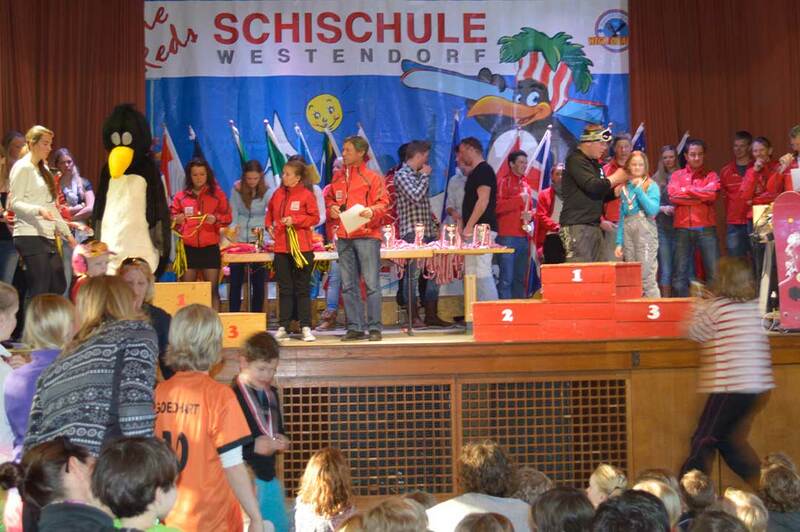 This was by far the best part of the week to me, not least because my youngest son won a bronze medal in his category which he proudly received on stage at a big presentation in the local village hall on Friday afternoon. 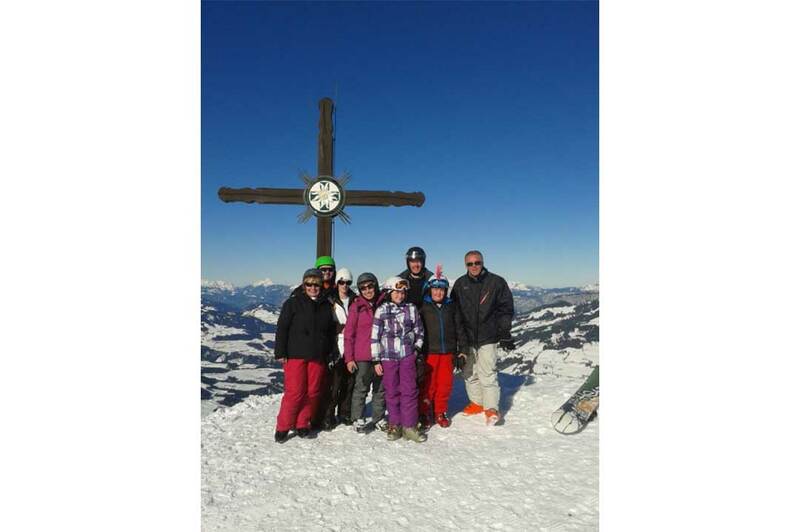 So why would I recommend that you choose Westendorf for your family skiing holiday? They have guaranteed snow with snow cannons working every night so that even if it doesn’t snow there is a fresh covering on the slopes every morning. 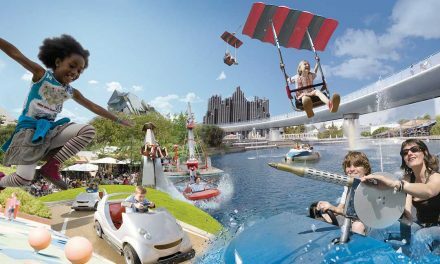 It is very child-friendly and super safe. 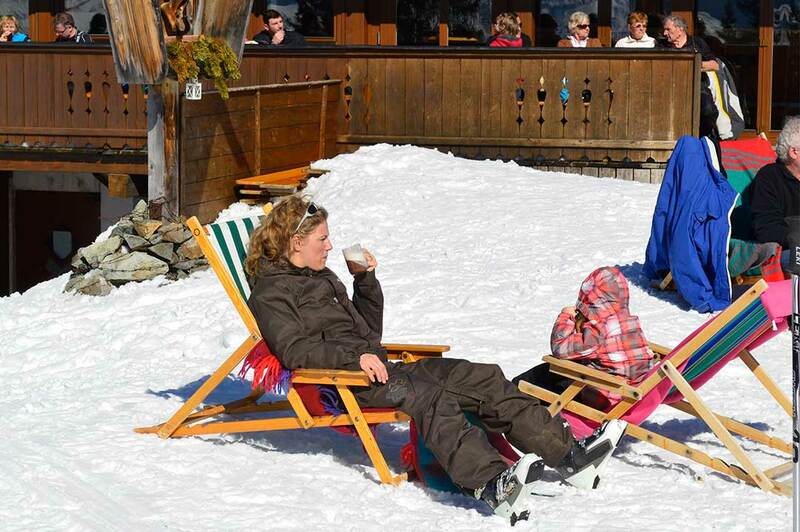 The après ski is just amazing and the facilities are top. 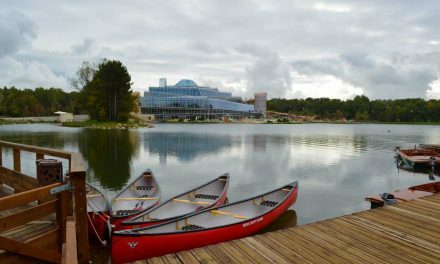 They have been accommodating families for years and are very good at it and all their systems are geared up for it. 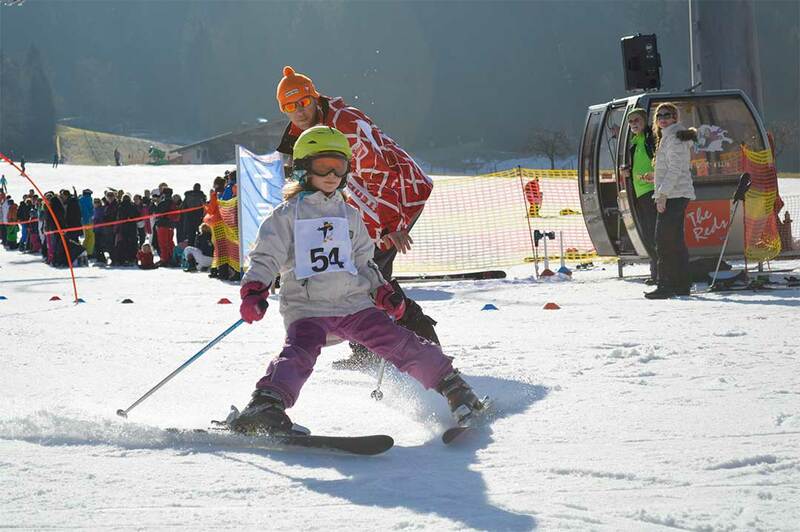 If you have had a burning desire to learn to ski but have never got around to it, my advice to you is, do it while the children are young because they learn so fast and the skill will be with them for the rest of their lives. The bonus is that you get to see them do it and you get to do it too, although maybe not quite so effortlessly! So will I go again? Too right! I’m already booked in. 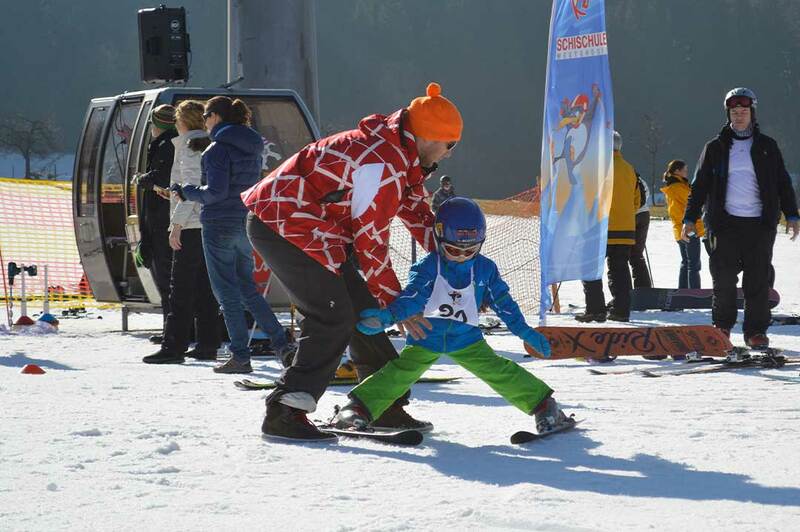 Hope to see you on the slopes.